Our highly sought after 4-wire RGB LED rope lights will turn your project into a stunning work of art. With 2 controller options and a wide variety of accessories we have everything you need to make a spectacular and dynamic lighting project. Looking for a specific length? Let us custom cut them for you. Get more details on our custom cut RGB rope light page. Only need a single color? 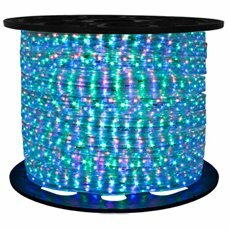 Visit our 148 foot LED rope lights page.BrilliantTM Brand 4-wire RGB Color Changing LED Rope Light spools give you the ability to create dazzling color changing effects in both indoor and outdoor lighting applications. Choose either the Mini In-Line RGB Controller for basic color changing effects and a maximum run of 165 feet, or upgrade to Weatherproof Deluxe Controller for a maximum run of 148 feet which has multiple single color options and color changing effects but with the convenience of a remote control. LED Rope lights are easily customizable and can be cut at 39 inch intervals. They also provide amazing versatility because of their extreme flexibility. Commercial grade Brilliant TM Brand RGB LED Rope lighting is an excellent option for clubs, restaurants, holiday displays, and homes.